Measures just under 8 inches by just under 4 inches. The attached wallet chain measures is 12 inches long. Attach the end of it to your belt with the leather piece or clip it on your pants belt loops. 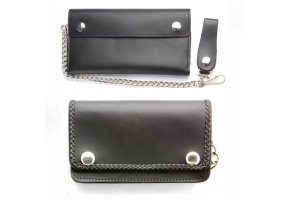 This is a leather wallet designed for Bikers who ride motorcycles. Carry it on your pants back pocket and attach the chain to your pants. If your wallet falls out of your pocket while riding, at least it will still be hanging off your pants. Inside the wallet are 4 partitions, two full size partitions for your small and large bills and two slimmer partitions for other things such as credit cards. In addition to 4 open partitions the wallet has a zipper pocket as well and this zipper is big enough to fit a giant screen samsung galaxy s2 cell phone. There is a driver license holder in the center.